When Ichabod Crane arrives in the spooky little village of Sleepy Hollow as the new schoolmaster, Katrina Van Tassel is instantly drawn to him. Through their shared love of books and music, they form a friendship that quickly develops into romance. Ichabod knows that as an itinerant schoolteacher of little social standing, he has nothing to offer the wealthy Katrina – unlike her childhood friend-turned-enemy, Brom Van Brunt, who is the suitor Katrina’s father favors. But when romance gives way to passion, Ichabod and Katrina embark on a secret love affair, sneaking away into the woods after dark to be together – all while praying they do not catch sight of Sleepy Hollow’s legendary Headless Horseman. That is, until All Hallows’s Eve, when Ichabod suddenly disappears, leaving Katrina alone and in a perilous position. Enlisting the help of her friend – and rumored witch – Charlotte Jansen, Katrina seeks the truth of Ichabod Crane’s disappearance, investigating the forest around Sleepy Hollow using unconventional – often magical – means. What they find forces Katrina to question everything she once knew, and to wonder if the Headless Horseman is perhaps more than just a story after all. In Alyssa Palombo's The Spellbook of Katrina Van Tassel nothing is as it seems, and love is a thing even death won't erase. The Spellbook of Katrina Van Tassel is an enthralling read for any historical fiction fan—at any time of the year—although this spooky, haunting tale is perfect reading for late fall evenings just as the weather turns cool and crisp. Readers will find themselves reaching for a hot apple cider and a warm blanket as they fall under the spell of an All Hallows Eve from centuries past. Perhaps the best thing about the novel is the way Palombo captures the gothic tone of a post-revolutionary war America along the banks of the Hudson River, for Sleepy Hollow is also a character just as important as Katrina and Ichabod. The rich—feminist—voice of Katrina Van Tassel breathes new life into an era when America was a young nation of immigrants coming together to build a new world from the roots of their European traditions and legends. The heartbreaking love story of Ichabod Crane and Katrina Van Tassel brings Romeo and Juliet to mind. Doomed from the start, these two fight for their love even when the odds are stacked against them as Brom Van Brunt relentlessly pursues the object of his desire. He is her father’s ideal suitor for his daughter’s hand, while poor Ichabod is not. Yet, Brom sees Katrina as a prize he will possess at any cost. Somewhat predictable, their story unfolds almost like a train-wreck. You just can’t look away, even when you know what’s going to happen. One can only respect the sheer amount of research and hard work that went into the making of this book. I applaud the author for her attention to detail, not only to the original story, but to the era in which Katrina’s story takes place. Unfortunately for this lovely book, the title is wildly misleading. The reference to Katrina’s ‘spellbook’ is nothing more than a notebook she keeps of stories and details concerning Ichabod’s dsappearance. However, Charlotte Jansen, Katrina’s best friend and confidant, holds the key to the magic of Sleepy Hollow. With her herbs, potions, tarot cards and visions, she guides Katrina along a journey to find the truth. As a dynamic character all on her own, it leaves one to wonder what The Spellbook of Charlotte Jansen might have been. The gripping, lyrical tone of the novel pulls readers in with the arrival of the handsome Ichabod Crane and as their love story unfolds, the pages fly. Somewhere around the middle, the story stalls as Katrina falls into a maddening pit of indecision that doesn’t pick up again until the final chapters. And those chapters are a reward for the faithful reader as Katrina finally learns the truth and figures out how to pick up the pieces of her life again. The legend of the Headless Horseman plays a pivotal role in the story—as a metaphor and, ultimately, as a self-fulfilling prophecy for the tale’s three main characters. While new readers might anticipate a genuine ghost story with supernatural elements, one must remember this is a real-world retelling of a legend. Katrina’s story is as it should be—an in-depth look at how myths are rooted in truth, and how those legends can shape the lives of a people. Historical fiction fans of all ages will enjoy this enchanting tale of love and loss amid the swirling fog and dark legends of the real Sleepy Hollow. 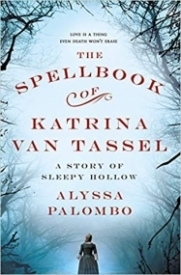 "The Spellbook of Katrina Van Tassel" is a retelling of the Legend of Sleepy Hollow from the point-of-view of one of the characters (Katrina). Katrina is a young woman of 18 who loves to read and spend time with her best friend Charlotte. Charlotte and her mother are midwives who also know about herbs and can treat ailments. Charlotte may also be able to see some visions of the future. It was this skill that got her labeled a witch by Brom Van Brunt (Brom Bones). While the three used to play together frequently as children, after Brom's accusations, Charlotte and Katrina refused to acknowledge him. Katrina's family is wealthy and so they would like to see her make a good match. It is their wealth and her father's good standing that leads him to be a powerful member of the community. As such, the new schoolteacher, Ichabod Crane, comes to call on him and is offered a place to stay until he can begin to stay with his pupils, as is customary. When their eyes meet, Katrina finds herself drawn to the schoolteacher from Connecticut. As he offers her singing lessons and they begin to spend more time together, Katrina and Ichabod begin to fall in love. However, as Ichabod is poor and would be seen as a fortune hunter, they must be careful about their attractions. Brom is also set on making Katrina his wife. Although she wants nothing to do with him after his accusations of Charlotte, Katrina's father also thinks Brom would be a good match. Brom's father (and thus Brom) have the second largest fortune/farm in the area and the joining of the two is good business. Considering they were also friends as children, Katrina's father also believes their love would grow over time (love was not the basis for marriage in the 1700s). However, Katrina only wants Ichabod (although this remains a secret due to his socioeconomic status) until Katrina feels the time would be right for him to announce his intentions. We all know where the story is fated to go (as it does follow the Legend of Sleepy Hollow). However, this is a story of love, forbidden romance, jealousy, and mystery. The superstitious town has its legends, particularly of the Headless Horseman. Katrina sees him in her dreams. While I was expecting more magic (primarily due to the title), here it is limited to visions and herbal concoctions (though I don't think this qualifies). The vast majority of the book is about Katrina's love for Ichabod and the subsequent anguish when he disappears. My favorite character was Charlotte, and I really liked her big involvement in the story and her wisdom. I would have loved to read the story from her perspective too (or maybe she could have her own story someday). Overall, I felt that this retelling really brought new life to the old story. I did find that it dragged a bit in the middle, but the ending was quite fascinating, and I enjoyed it overall. The story really takes on new meaning when reimagined from Katrina's perspective, and this is a great Halloween season read.